A. What snacks are we going to chow down on Superbowl Sunday? B. What am I going to get my better half for Valentine’s day? For question B , unlike last year, this year I will be offering my advice in two parts: Geeky Gift Ideas For Him and a second list of Geeky Gift Ideas For Her. Also, like last year, I included a variety of price points on the list. And don’t forget to check out our Valentine’s Day Gift ideas For Her. One of the greatest improvised lines in cinematic history is Han Solo’s response to Princess Leia’s “I love you” in Star Wars: The Empire Strikes Back. Help your man channel his inner scoundrel with these amazing Star Wars “I love you/ I know” cufflinks. These officially licensed Lucasfilm cufflinks will make your scruffy looking nerf herder the best looking man in any bridal party! Nothing sets the mood for a romantic evening like candle light. Especially if that same candle gives off the sweet, sweet scent of a melting Gestapo agent Toht! This hand painted wax candle is the perfect gift for that Indiana Jones fan in your life! Is there a more fitting way to show your man that he is your “precious” than this Lord Of The Rings Ring on a chain? I used to work in a warehouse and we all wore our wedding rings on chains around our necks. Partially to keep them clean but also we didn’t want our rings cut off if we broke our fingers. I would have loved to have received this Tungsten Carbide Ring from my woman! The couple that games together stays together. Twitch Prime is the ultimate gift for any gaming enthusiasts. It includes a ton of gaming content such as bonus games, exclusive in game content and channel subscriptions. Follow this link for a free trial membership! Nothing makes your man feel more “worthy” than when he needs to grab his tool box to fix something around the house. Thor’s Hammer Mjolnir unfolds into this 44 piece tool box that includes everything you may need, whether it be taking down your evil step-brother from Asgard or building your latest Ikea acquisition. Why go out and fight the crowds, weather and inflated prices for a romantic evening? Stay home for a nice evening saving Princess Peach or battling the evil Shredder on this retro 8-bit Nintendo/16-bit Super Nintendo gaming system! Normally if you ask your man what gift he would like, crew cut socks would not make the top ten…thousand. Unless, of course, the socks allow him to dress up as everyone’s favorite neighborhood ‘Merc with a Mouth’ Deadpool! If the way to a man’s heart is through his stomach, then deep frying something simply gets you through his stomach faster. How could any person not love Pizza Rolls? They are pizzas but bite-sized and fried! Perfect to serve at your Big Game party, gaming night or simply binge watching with your significant other. Little trick I learned in college, Pizza Rolls make excellent pizza topping as well! This is the perfect gift for any Star Trek: The Next Generation fan (still the best series of the franchise by the way) or cell phone junkie! Not just a prop or collectible, this is ComBadge utilizes a built in microphone and speaker with Bluetooth version 4.2 to connect with any cellphone or tablet. The ComBadge is held in place by high strength magnets so it wont damage your clothes. The ComBadge is rechargeable and last up to 2 hours of constant usage or 48 hours in “Cosplay Mode”, where you can tap the ComBadge to hear the classic chirp sound effect from the TV series! The perfect Beer and Wine Glass Set is coming! Whether you are enjoying a quiet adult beverage at home with your significant other, attending a BYOB Red Wedding or at a party and you simply want to communicate to others exactly what you do, this Beer and Wine Glass Set is all you need! 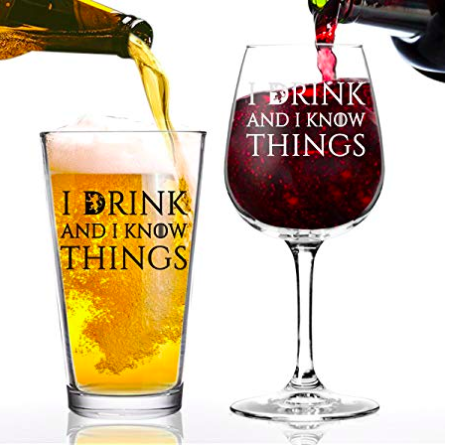 Made in the USA and dishwasher safe, this 16 oz pint glass and 12.75 oz wine glass are the perfect gift to enjoy the upcoming season of Game Of Thrones with. They can be purchased individually, but where is the romance in that? Well that is my list For Him. Please comment below with any suggestions you think I may have missed. Make sure you like and subscribe to my site so you don’t miss the Geeky Daddy’s Valentine’s Day Geeky Gift Ideas For Her list that will be coming soon. Previous Sonic Adding Deep-Fried Oreos To It’s All Day Menu! You can buy Pizza Rolls by the case?! Oh geez, my husband would LOVE that. haha. I should look into that and the Twitch membership! Ahhh, the Nintendo!!! I want that for myself actually!! I gave my husband a Godzilla figure for his last birthday. I think he would love all these gifts. I think the retro Nintendo set would be an especially good one. I enjoyed this article so much. Great ideas!!! I love the Game of Thrones glasses! So cute! what cute and adorable gifts! thanks for sharing! What awesome and unique ideas! I know someone who would love the Raider candle! The geek in me approves of all these gifts! I’m not sure if the retro SNES is still hundreds of dollars on eBay or not but watch out. I love the cufflinks and the deadpool socks. Can definitely pull off an outfit. These are great!! I never know what to get my husband!!! I love the Thor’s hammer toolbox! These are all such great ideas! I love seeing gift guides from other guys – such an insight. These are awesome ideas! Thanks for putting this together – I especially loved the Thor hammer tool set! What a fun list! Thor’s Hammer Toolbox is really cool. These are great! The case of pizza rolls is hilarious. I’d love it! This is an adorable list! Love that retro Nintendo! HAHA! Okay, seriously that candle and those pizza rolls had me laughing over here!! Nice list. I like. These are some great ideas, I love the idea of cufflinks! So classic! Omg im going to pizza roll my pizza all the time now HOW HAVE I NEVER THOUGHT OF THIS???? I love my nerds but that candle is top tier!! My husband is hard to buy for because he doesn’t ever need or want anything. I’ll bet he’ll appreciate one of these gifts though! Those are some great and funny ideas! Those Star Wars cuff links are so fun, I would def get those for my husband!